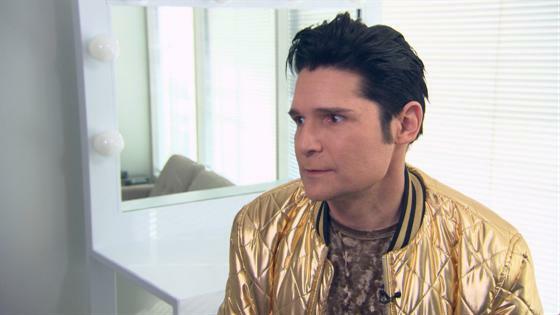 Corey Feldman is ready to fight against sexual abuse with as many people as possible. Just a few short months after launching his Truth Campaign, the actor remains hopeful that he can raise $10 million to make a film about sexual abuse in Hollywood and his own life. He also is more than willing to collaborate with other individuals including Terry Crews who recently came forward with his own sexual assault allegations. "I thought about [reaching out to Terry], but I've been pretty overwhelmed with everything that I'm doing, but here's an open invitation," Corey shared with E! News' Melanie Bromley. "Terry, if you're listening, I'm more than happy to join forces with you and work together. I'm willing to work with anybody. Can I just put that out there?" He continued, "I'm willing to work with anybody that wants to aid in this fight. If you want to help me get this film made, to tell the truth, please help me." Corey has been vocal about his motivations behind his ongoing crusade to expose alleged sexual abuse in Hollywood. Before Corey Haim's death in 2010, the Goonies star claims his close friend asked him to shed light on the abuse he says they endured while working as young, child actors. Back in November, Corey appeared on The Dr. Oz Show and claimed former actor Jon Grissom molested him as a child. Jon has never commented publicly on the accusations. After the premiere of Lifetime's original movie A Tale of Two Coreys this past weekend, Corey (who served as an executive producer) now has even more time to help fight for a cause so important to him. "If you want to help me get the statutes changed, please help me. If you want to help me get your story out, I will help you," Corey shared with E! News. "I'm willing to do whatever it takes. I'm here to be a soldier. I'm not in it for me. I'm in it for all of us. Let's work together, please."